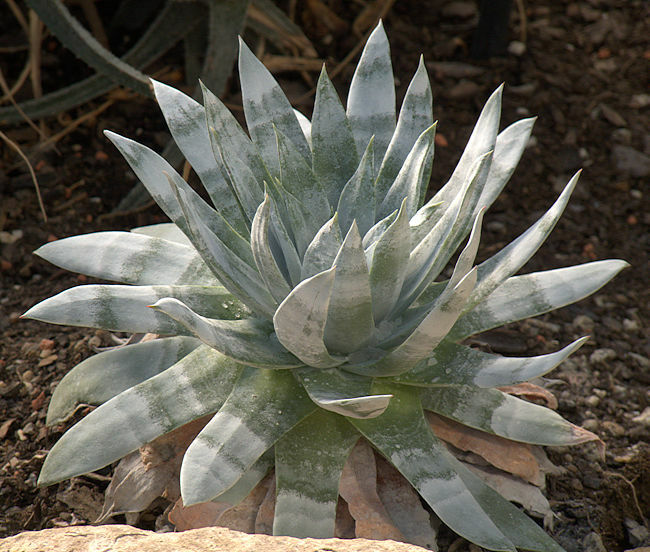 Dudleya is a genus of more than 50 small rosulate succulent plants native to Arizona, California, Nevada, Oregon, Baja California, Mexico and coastal islands and possibly extending into S. America. 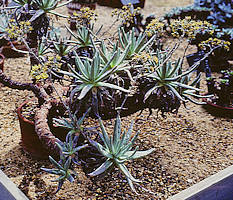 Dudleyas have to be propagated from offsets or seed as individual leaf cuttings will not root and grow into new plants. 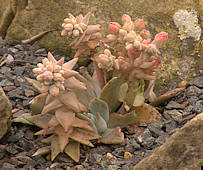 Despite the similar appearance of Dudleya and Echeveria and overlap in their geographical distribution, molecular analysis suggests that the genus Dudleya is closer to Sedum. 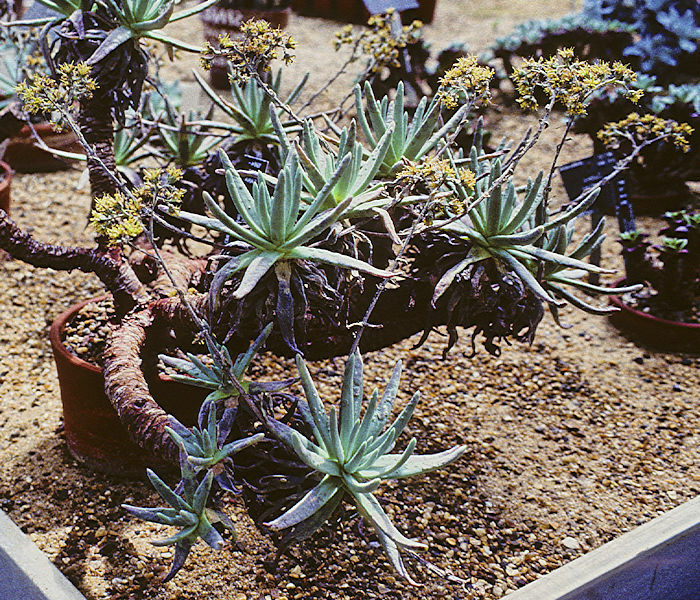 The former genera Hasseanthus and Stylophyllum have been incorporated as subgenera of Dudleya. 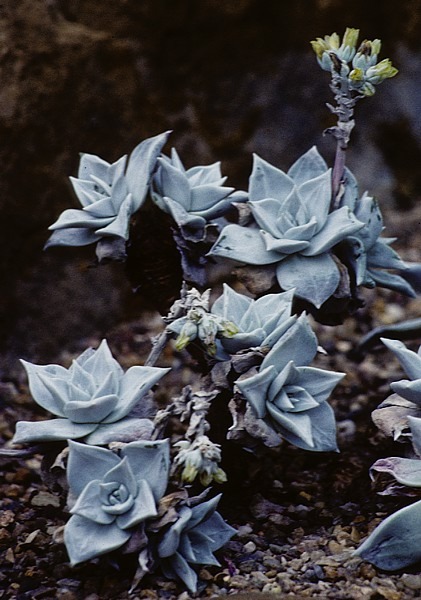 Cultivation: Most Dudleyas are insufficiently hardy to survive a cold, wet winter, but they can be housed under glass for the winter where they only need to be frost-free. 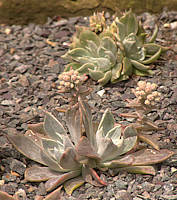 However, a couple of species planted outdoors in the rock garden at Royal Botanic Gardens, Kew, appear to be cold-wet hardy, despite originating in a warmer, drier climate. It may well be that those from the coastal margins of Northern California are also worth trying outdoors. 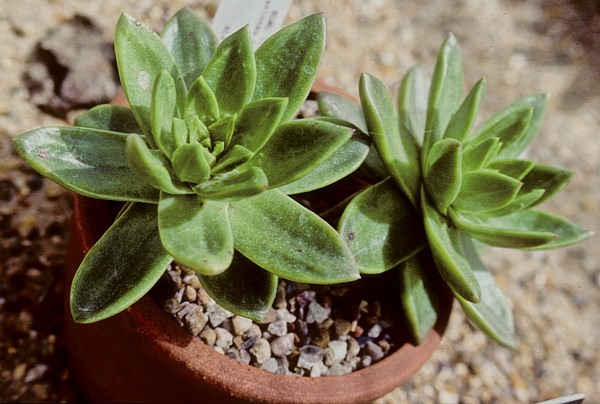 As with many succulent plants, a sunny position is needed to obtain an attractive compact rosettte and for the leaves of some cultivars to colour up. They are often stuffed under the growing bench with poor lighting and will not do their best this way. However, most species are happy with cool but frost-free winter conditions. In a poor light the plant will quickly become soft and etiolated and prone to fungal damping off. Remove dead basal leaves from rosettes to reduce the risk of fungal attack. Dudleyas have to be propagated from offsets or seed as individual leaf cuttings will not root and grow into new plants. 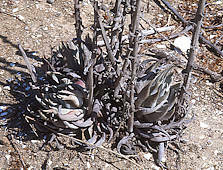 The rosettes can usually be re-rooted very easily. If the stem below the rosette becomes long and unsightly it is a simple matter to cut it off an inch or so below the rosette and re-root. Left: San Bernardino Mountains, California. Right: rock garden at RBG Kew. 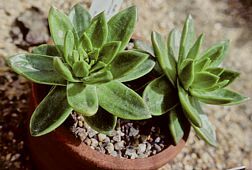 Small 4 in rosettes of succulent blade-shaped smooth pale-green leaves, often pink or yellow in full sun. The multi-branched inflorescence bears pale yellow to orange flowers. 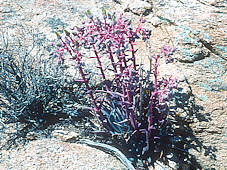 Native to limestone outcrops of mountains in the Southern Sierra Nevada, California although seen here growing on granite in the San Bernardino Mountains. 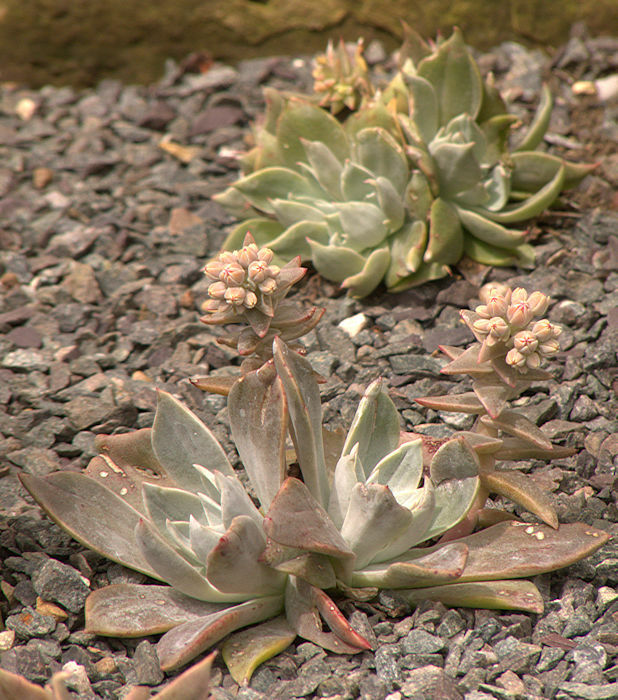 Plants in the rock garden at RBG Kew have survived several cold-wet English Winters. 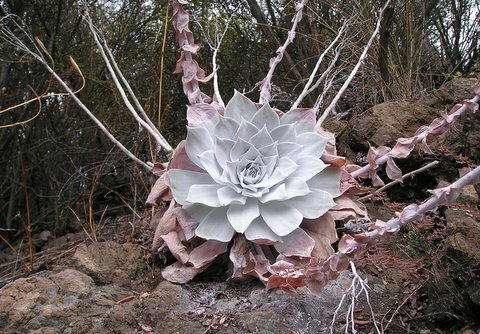 A species with spectacularly large 6 in diameter succulent, fleshy rosettes, colouring up attractively where they are in full sun. Photographed in Southern California just South of the Anza-Borrego Desert State Park. 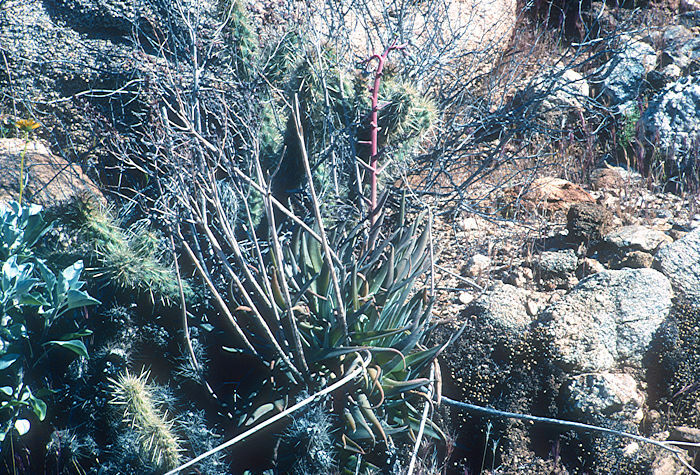 The large, very succulent rosettes appear to occupy a narrow horizontal band along the mountain side as though climatic conditions suit them at that particular elevation. 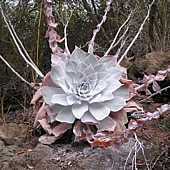 The large, usually-solitary rosette of 40 - 120 lanceolate leaves has a glaucous white surface. All-green forms are known. 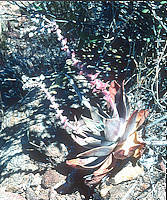 The inflorescence is a cluster of yellow flowers on a long, pinkish stem with numerous pink bracts. 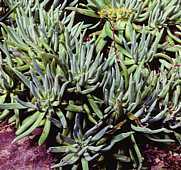 Native to coastal Baja California and coastal islands. 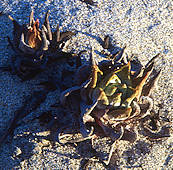 The rosettes are formed from many light green cylindrical leaves whose farinose coating is easily washed away. The inflorescence is an open cluster of pale yellow flowers. Native to coastal California and Baja California. 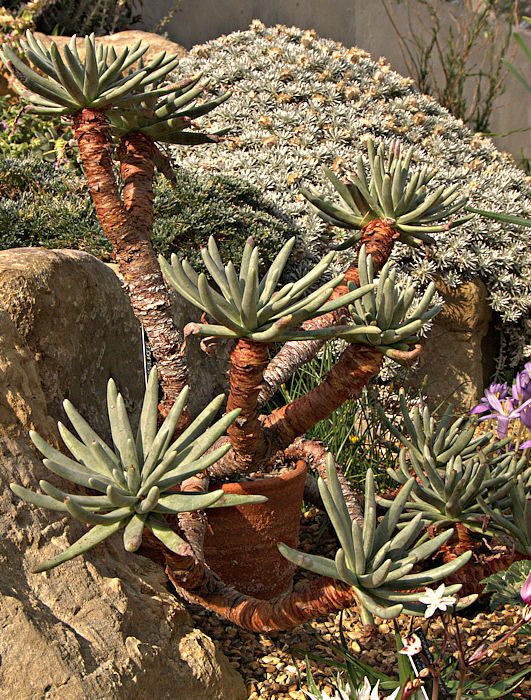 The elongated, branching stems carry rosettes of strongly pointed ovate, farinose or green leaves. The inflorescence is a dense cluster of pale yellow flowers. Native to coastal South-West Oregon and Northern California. 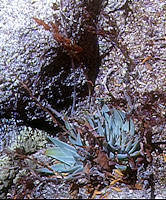 Both green and white farinose forms can be found naturally growing together. 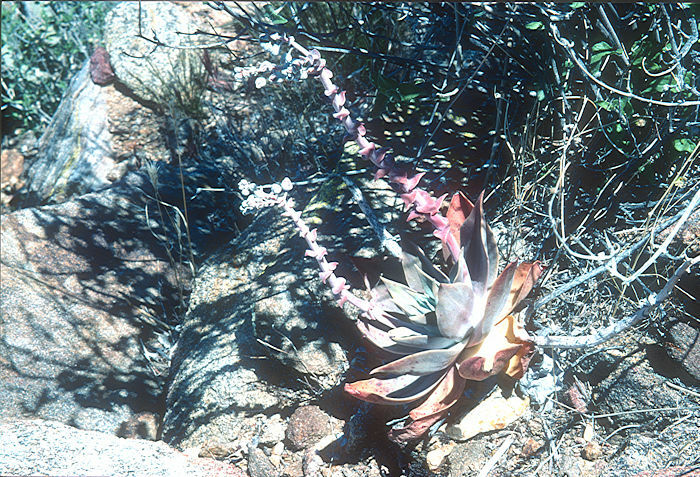 A species with a rosette formed from variable succulent leaves which may be lance-shaped to spade shaped. 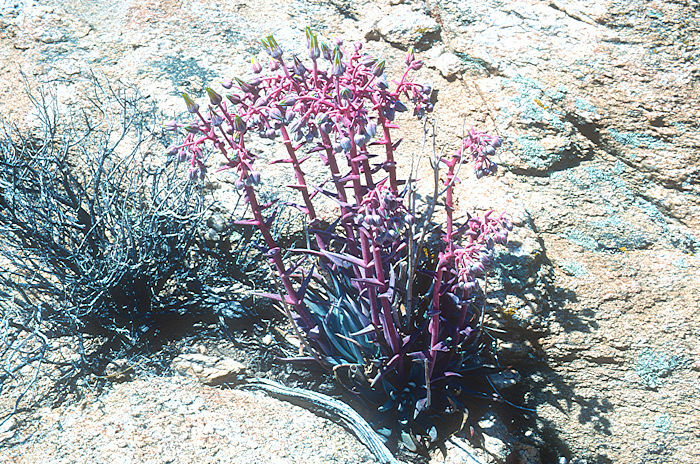 The sparsely-branching inflorescence bears small leaves along the lower portion below the many yellow, pink or red flowers. 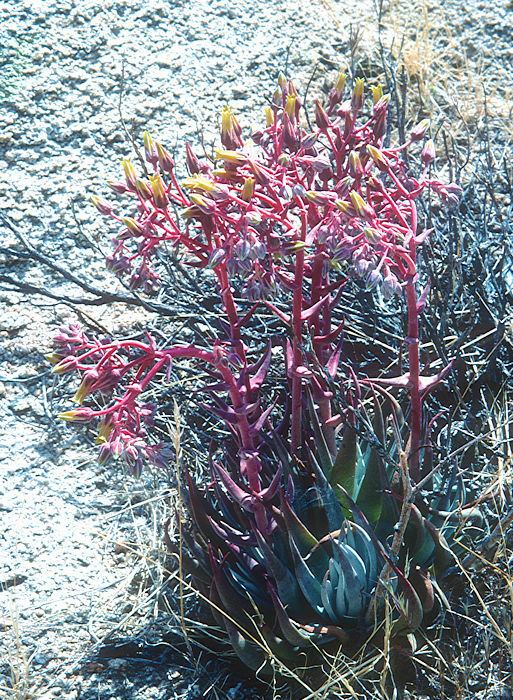 Native to mountains of Southern California and Baja California. Upper photos: in the rock garden outdoors at RBG Kew where this species appears to be hardy. Lower photos: Dudlyas on Imperial Beach Reservation, San Diego. 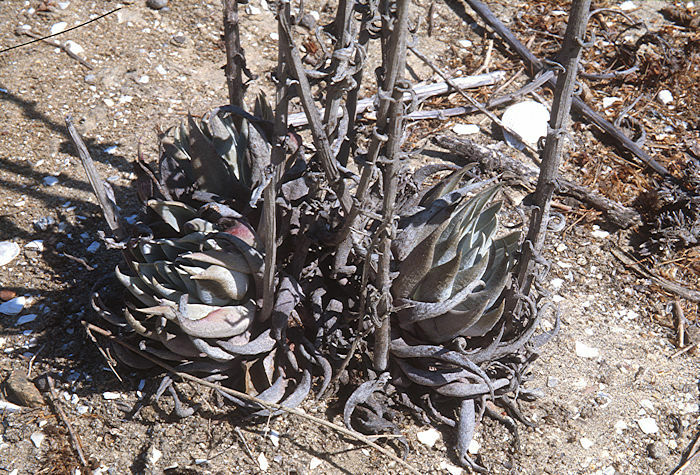 These large, silvery rosettes are formed from many (40-60) farinose oblong leaves, some with pointed ends. Seen in the Santa Monica Mountains, California. Photo: Nikki Thompson Los Angeles. 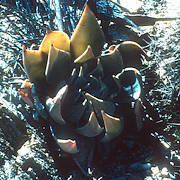 A species with a basal clump of narrow, lanceolate leaves that may be flat or somewhat inrolled. The long, pinkish flower stems carry a cluster of yellow bell-shaped flowers. 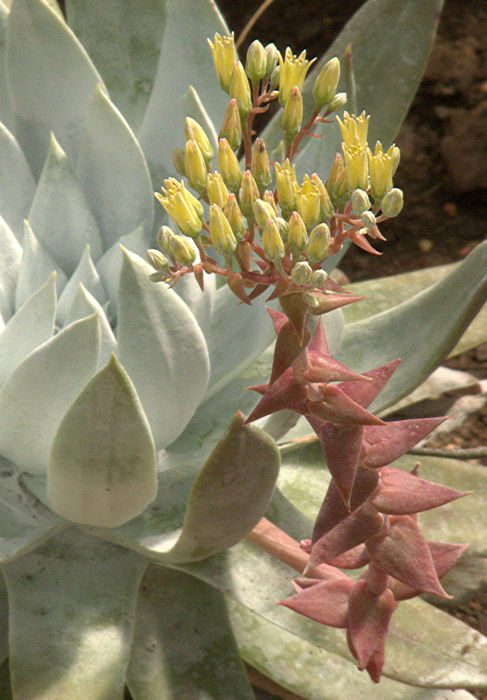 Photo: Southern California, South of the Anza-Borrego Desert State Park where it is likely to be Dudleya saxosa subsp. aloides (Rose) Moran 1957. 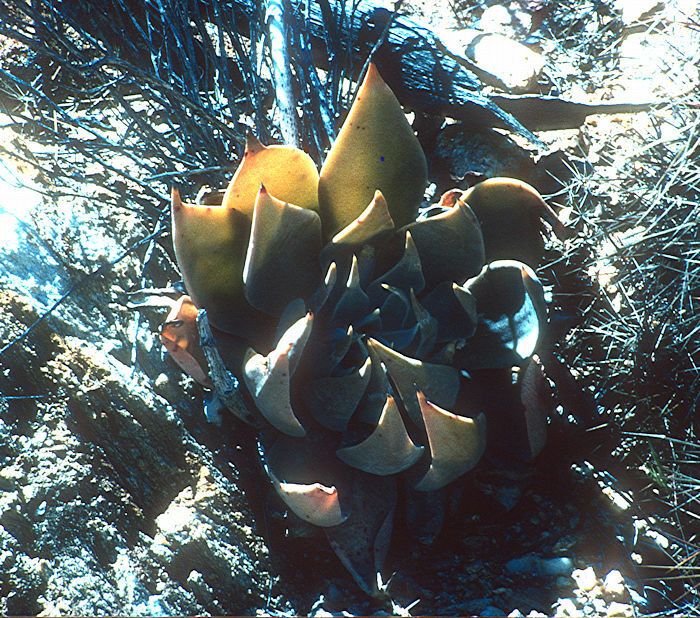 Dudleya saxosa in the Joshua Tree National Park. 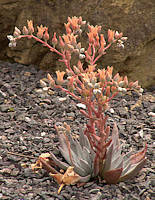 The basal caudex of this Dudleya produces a clump of fleshy, pointed, pale green leaves with a nearly cylindrical cross-section. The leaf surface is covered in a sticky substance with a resinous scent. 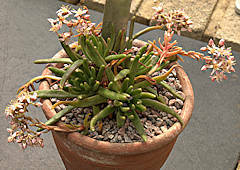 The inflorescence is an erect, branching stem producing a cluster of pale pink flowers with red streaks along their petals and exserted stamens. Native to Southern California with a very limited distribution in Orange and San Diego counties. 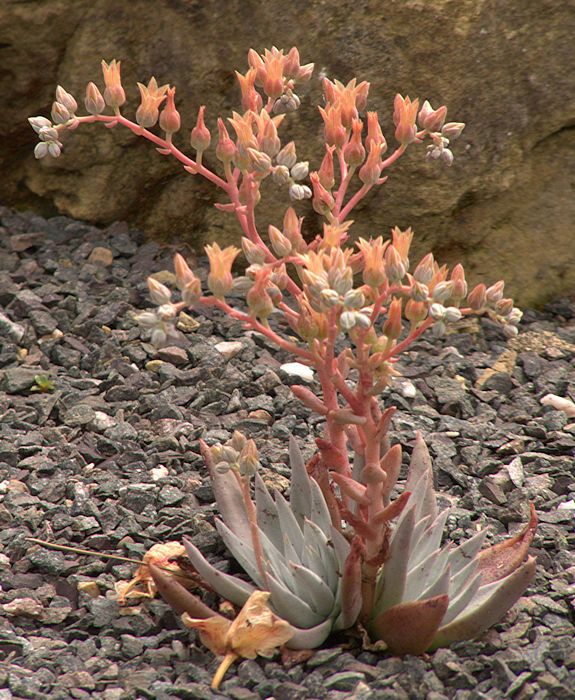 Dudleya virens Moran 1943 includes four subspecies from coastal California, islands and Baja California. The flowers are attractive to humming birds. 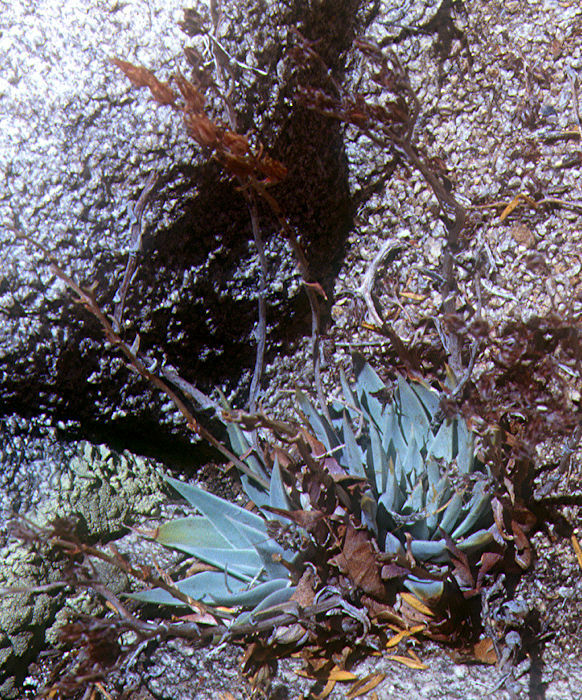 Dudleya virens ssp extima - Guadalupe Island, Baja California. Dudleya virens ssp. hassei - Catalina Island, Ca. 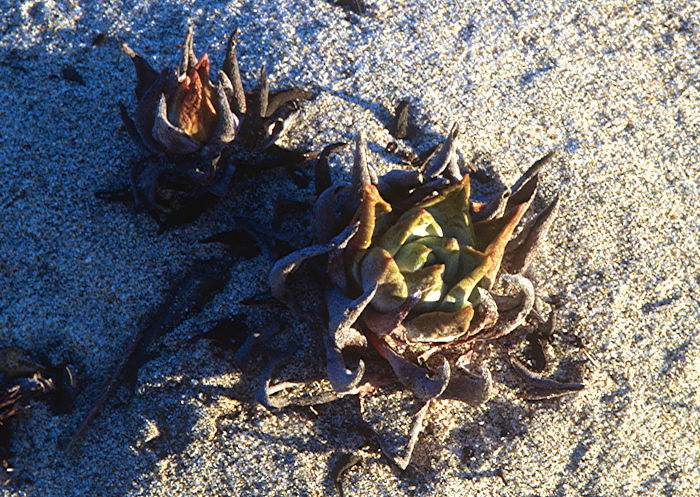 Dudleya virens ssp. insularis - Catalina Island, San Nicolas Island, Palos Verdes Hills, Ca. 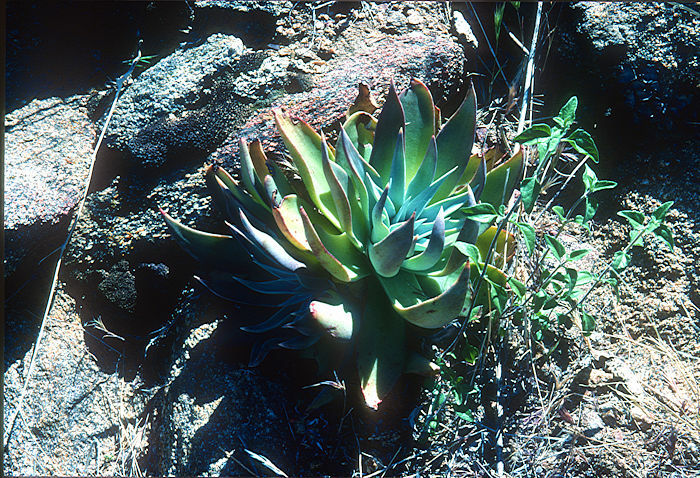 Dudleya virens ssp. virens - Catalina Island, San Clemente Island, Palos Verdes Hills, Ca. 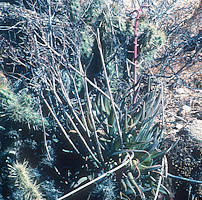 The thickened branching stems carry rosettes of narrow, flattened glaucous green leaves. The inflorescence is an open cluster of yellow flowers on a long greyish stem. 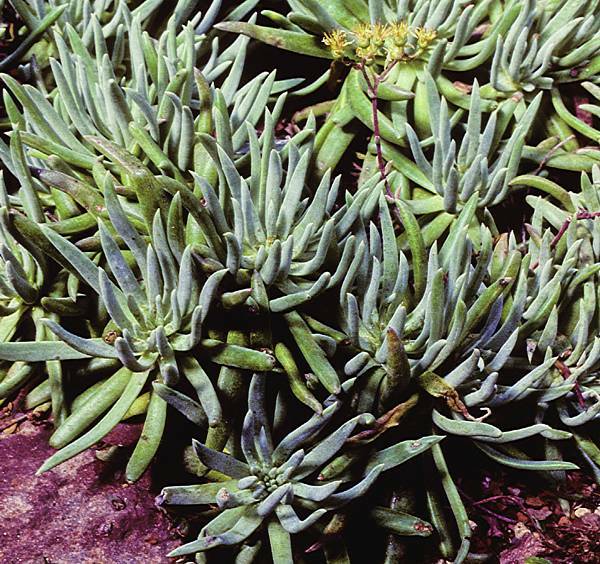 Native to coastal rocky slopes of Santa Catalina Island, California.